So, you’re in a precarious “situation” with the mafia? 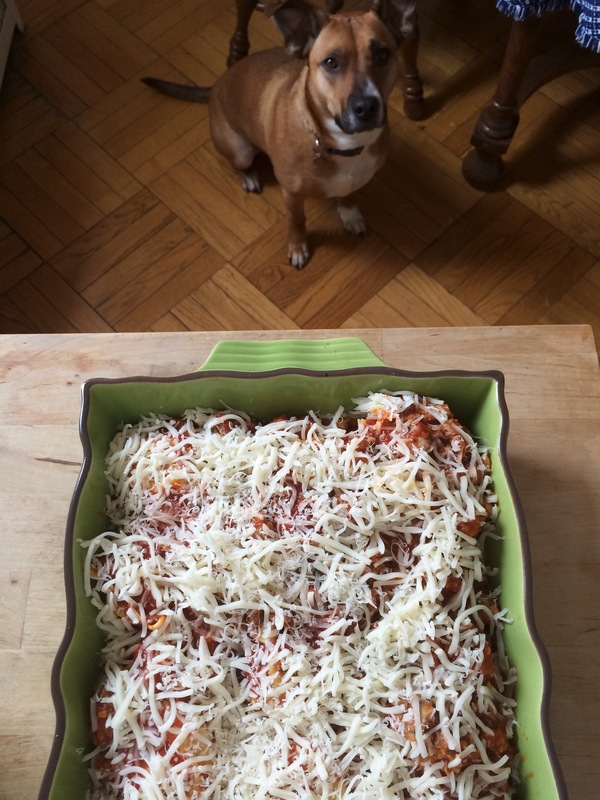 (It happens … I guess) Cooking up a tasty lasagna would really ease some tensions, right? Problem is, you’ve got neither the time nor the fresh ingredients for a proper dish. 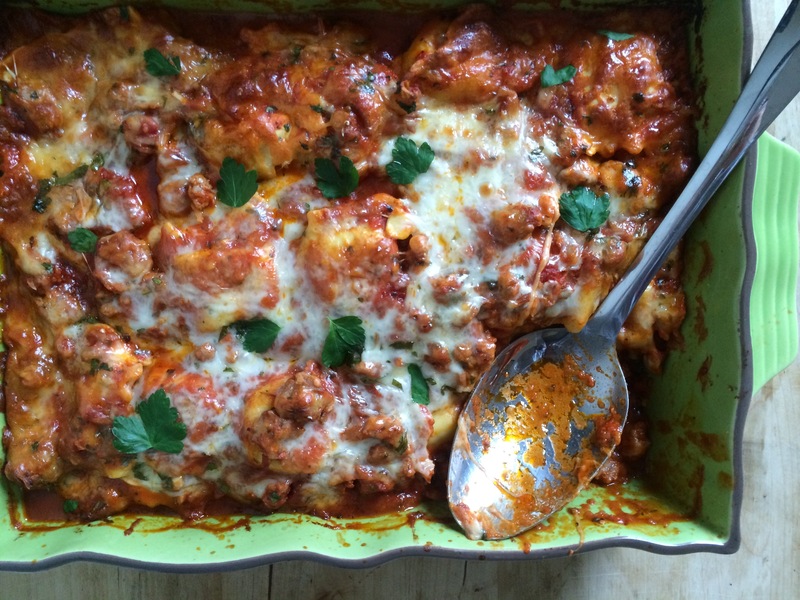 Lasagna noodles, ricotta cheese filling, the timely/messy process of layering of everything together? Here’s the perfect shortcut. We’re using frozen cheese ravioli! I had to get somewhat fancy with my marinara sauce. (I couldn’t help it.) I added some aromatics and Italian sausage. If you need to save time, then crack open a jar of store-bought marinara. In this case, make sure you remember to add 1/2 cup of water. The ravioli’s need a bit more liquid to cook in. Your family will think you’ve been slaving away all day. The guys in velvet sweat suits and greased back hair will think “uncle so and so” made it fresh. 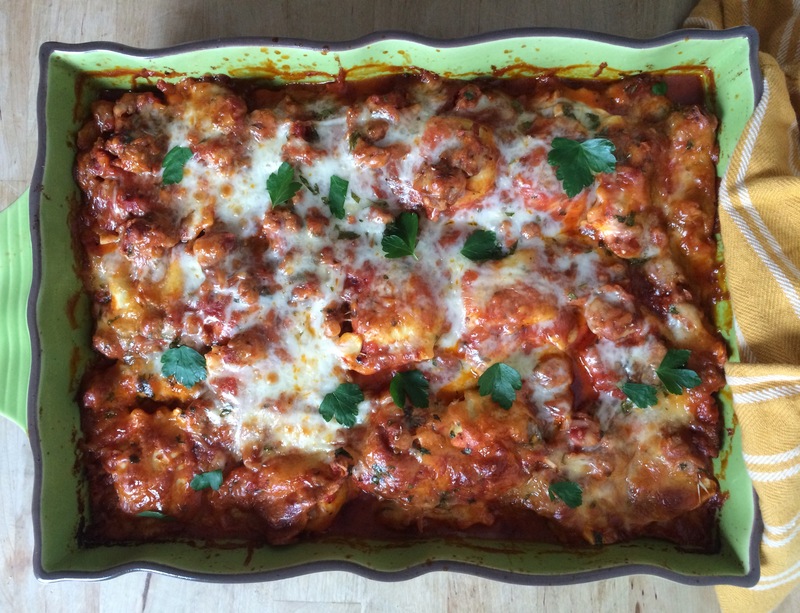 Lazy Lasagna. Saving family dinner … one meal at a time. Heat olive oil in a large saute pan over medium heat. Add onion and cook for 3-5 minutes until translucent. Add garlic and cook for an additional minute until fragrant. Add Italian sausage and cook, stirring frequently, about 8 minutes. Once sausage is fully cooked, remove from heat and drain off any excess fat. Add marinara, water, and 2 tbsp fresh herbs. Bring to a low boil and cook for 15-20 minutes. 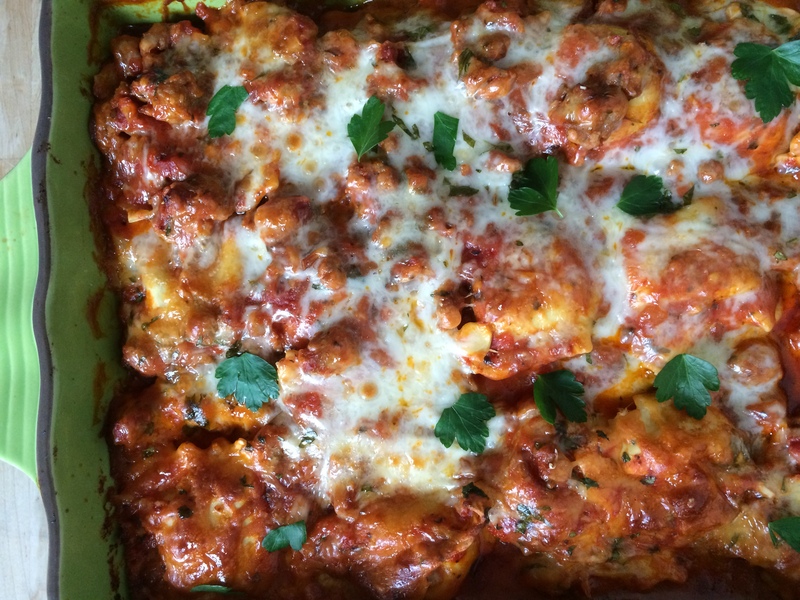 Remove from heat and allow to cool slightly before assembling lasagna. Spray casserole dish with nonstick cooking spray or grease with a small amount of vegetable oil or butter. Time to begin assembling the lasagna. 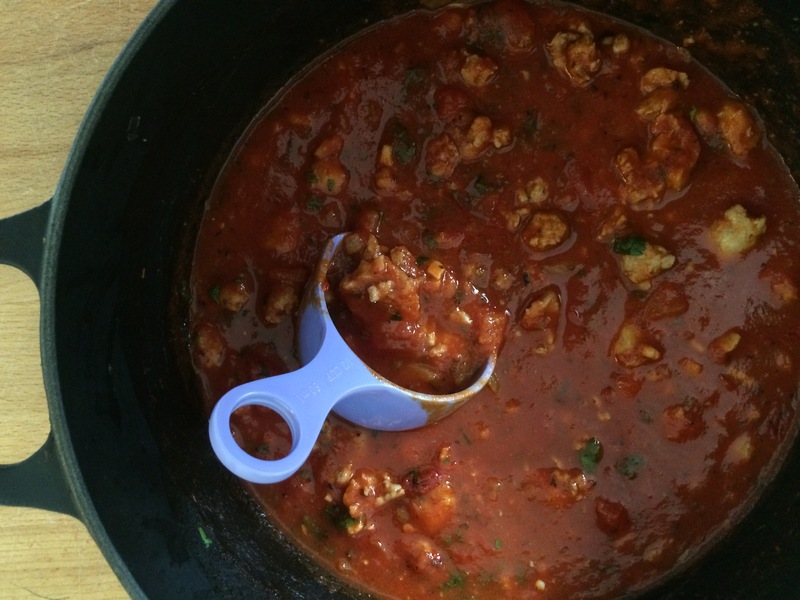 Add one cup of marinara to prepared casserole dish to coat the bottom. In the following order, add half of the ravioli, 1.5 cups marinara, 1.5 cups shredded mozzarella, and 2 tbsp Parmesan cheese. 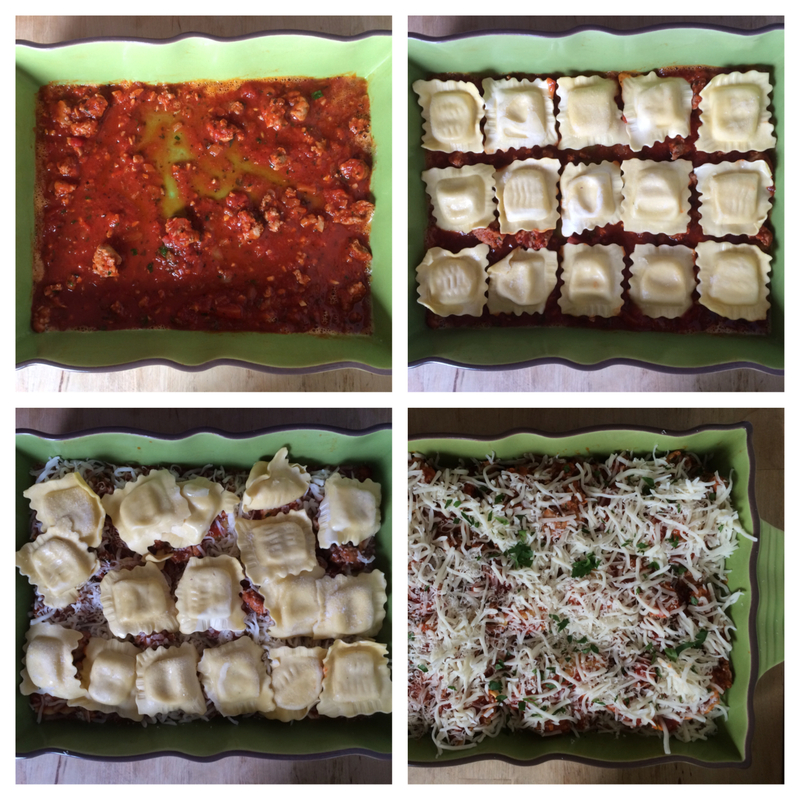 Repeat with another layer – the other half of the ravioli, the remainder of the sauce (about a cup and a half), 1.5 cups shredded mozzarella and 2 tbsp Parmesan cheese. Cover dish with aluminum foil and bake covered for 50 minutes. Note, spray the inside of the aluminum foil with nonstick cooking spray (or smear with a small amount of vegetable oil) so it does not stick to the cheese. Remove foil and bake for an additional 10 minutes. The cheese will be melted and sauce will be bubbling in the corners. Add 1 tbsp fresh herbs on top and allow dish to rest for 5 minutes before digging in. My sous chef couldn’t resist the aroma! Thanks, Cindy! I don’t mind at all.